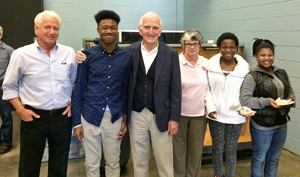 Thanks to the South Carolina Philharmonic and the Salvation Army, a dozen young people had an eye-opening, mind-expanding experience at the Koger Center on Saturday, March 12. They attended a rehearsal of the South Carolina Philharmonic, and had the opportunity to share breakfast with the conductor and musicians backstage. They also met visiting violinist Sayaka Shoji, who was playing with the Philharmonic that evening. The Paris-based star, who plays a 1729 Recamier Stradivarius, signed autographs for the visitors, as did Conductor Morihiko Nakahara. The experience for the kids, participants in a Salvation Army of the Midlands program, was made possible by Reece and Nancy Williams. Mr. Williams, a member with Callison Tighe law firm, is a life member of the board of the Salvation Army and a board member of the Philharmonic. “It was just an incredible experience for these children,” some of whom had never seen the Koger Center before, much less experienced orchestral music, said Melanie Miller, director of program services at the Salvation Army. Some of the kids, such as Joshua Harris, who plays violin, are budding musicians themselves. The experience was particularly meaningful to them, but it expanded horizons for all participants, who might never have had such an opportunity otherwise.